The Christoforas have been providing goods and services to the Woodstock community for over 40 years. 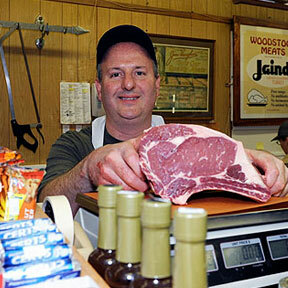 After working as a butcher for 25 years in the Grand Union chain, Vincent, Sr. opened his own store in Olivebridge, then bought Woodstock Meats in the most famous small town in the world (yes, THAT Woodstock). The building that houses Woodstock Meats used to be a private home. The house was moved (old-timers still remember seeing the building roll down the street) and was converted to a store. Butcher Gerry Simonetti made Woodstock Meats a unique community gathering place. He loved three things: Louie Armstrong, his customers and his job. Woodstock old-timers remember Woodstock Meats as the butcher shop with brass horns hanging above the meat case. Satchmo’s music was the soundtrack all day, every day as Gerry assured customers that “this steak is just like buttah!" There were as many as 5 butchers at one point, and the place sold just one thing: meat. Vincent Sr. bought Woodstock Meats from Gerry 40 years ago and now, Kevin, proudly continues the Woodstock Meats heritage of outstanding quality and service while expanding the business into a compact but complete grocery store and deli. 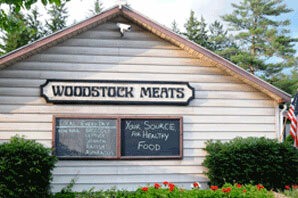 In 2005, Woodstock Meats began offering a complete line of antibiotic/hormone free meats. As customers become increasingly interested in the quality of the food they serve their families, Woodstock Meats has become a trusted source for wholesome, high-quality beef, Bell & Evans poultry and wild and organic fish. This is a traditional small town store with a personal touch. Need advice on preparation or not sure how much you need? Kevin, is the guy with the easy smile and a fast answer on portion sizes and sure-fire tricks for perfect meals. Need something special? They’ll order it for you. Looking for farm fresh produce and local products? 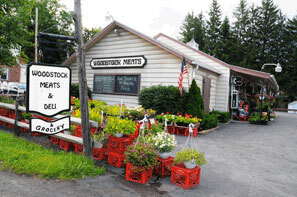 Woodstock Meats is like a year ‘round farm stand. From the prettiest Romaine lettuce you’ve ever seen to irresistible maple syrup and Honeycrisp apples that will become your new addiction, Woodstock Meats is a one stop shop for all your grocery needs. In season, you’ll find annual and perennial flowers to help you welcome the warmer weather, pumpkins and mums in the fall and ice melt and firestarters when the snow flies. Woodstock Meats is also a great place to grab lunch on the go. They offer their own butcher's specials of cut and cooked Roast Beef, Turkey, Pulled Pork and Meatloaf in the deli for cold cuts and sandwiches, as well as home made* salads... chicken, turkey, tuna, egg, macaroni, potato, cole slaw and baked beans - all ready to go in minutes. No matter how busy the place looks, you won’t be waiting long. Their motto is: "It's your lunch hour, not ours". 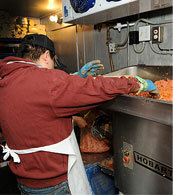 In 2008, Woodstock Meats launched is brand new "Raw Pet Food" product line called Butcher’s Blend. Inspired by countless customers buying human grade meat products for their pets, Kevin spent two years developing and testing formulas similar and common to, what breeders and professionals were using. Testing over 100 formulas at Cornel University’s forage laboratories and gaining approval from some finicky friends, Butcher’s Blend was refined into its final formulas. All of our products are registered with NY State Dept. of Agriculture and Feed Markets. We are licensed to wholesale in any retail store. Kevin’s background in Product and Package Development combined with his friend and designer Dennis Woloch, www.wolochdesign.com helped to create a beautiful looking, minimally packaged product. Woodstock Meats already possessed the equipment and work space to mix, grind and package what the average home owner doesn’t want to do in their own kitchen. We take the work out of making your pet a great meal. All you have to do is clean the empty bowl. Woodstock Meats is where you’ll run into your friends, and where you’ll be greeted by name by Vince, Kevin and all the staff. They’re proud to hear their store described as a quaint, charming, friendly, country Ma and Pa - everything you'd expect in a community butcher shop. Come on in and say hello! Woodstock Meats where Woodstock Meets. Arturo, Measuring and grinding the food. Julianne, age 11, Enrolled in Butchers Blend career development with 5th and 6th graders. Fernando beginning the "wrap" of a portioned product.